A stylish gift for the special man in your life, whether it’s a partner, Dad or Grandad. Cufflinks can be a matching pair or different prints on each and can feature the prints of up to 4 children. A unique and treasured addition that adds a little love to any shirt and tie! 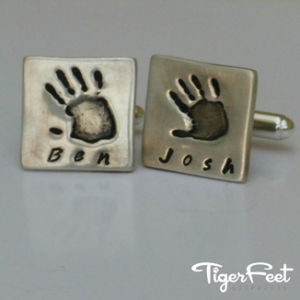 handmade fine silver cufflinks, set into sterling silver backs – which can feature fingerprints, handprints or footprints. 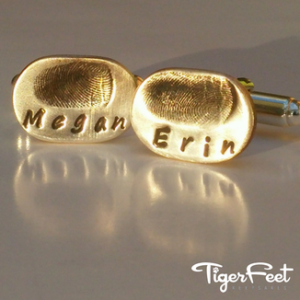 engraved stainless steel cufflinks – which can feature handprints, footprints or even handwritten messages.